Taurus Car Club of America : Ford Taurus Forum > Generation 1-4 Taurus & Sable Platform (1986-2007) > Maintenance and Repair > Taurus SE 2004 - No Start / Little start then putters and dies. What brand coil did you install? 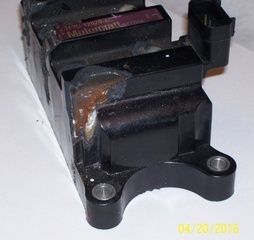 I am starting to think that the ignition coil is a preventative maintenance item just like plugs. Easy to test. Spritz the coil with tap water while warm idling. No change in how it runs and your coil is OK. If it goes crazy your coil is cracked and it is not working up to spec. Done that and mine went crazy. New coil and spritz water made continued to run perfect. I had a low level periodic misfire. No codes but they would happen soon if left alone. See pic, OE coil that I took off and used a screwdriver to open up the crack. Metal rusted. @Automender12345, I got the Motorcraft brand, same as the one I replaced.